Australian Catholic Bishops Conference president Brisbane Archbishop Mark Coleridge gives the official welcome and opening to Proclaim Conference, being held in Brisbane. Photo: Mark Bowling. 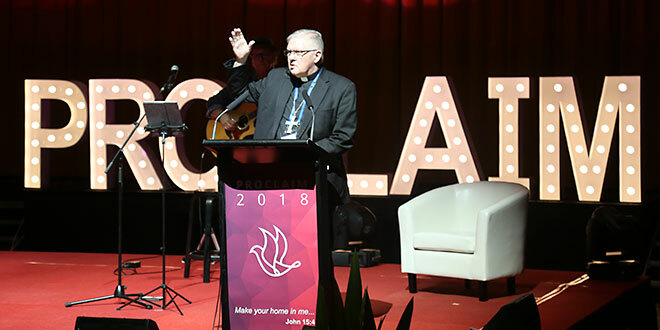 THIS is a spirit moment for the Church, Archbishop Mark Coleridge has told the Proclaim 2018 conference in Brisbane, challenging Catholic delegates to renew and rejuvenate the Church in Australia. “I am intensely conscious as I sat amongst you that I face the danger of being pale, male and stale,” Archbishop Coleridge said. More than 600 delegates are attending the three-day conference, with the theme “Make Your Home in Me” (John 15:4) with an agenda to explore new ways of contemplating the face of Christ in community and to find new mission pathways. The goal is to engage parishes and faith communities in a conversation focusing on five key areas – leadership, culture change, young people, belonging and evangelisation. Drawing on the example of the young Thai soccer team – the Wild Boars – and their coach trapped in a cave for two weeks, Archbishop Coleridge said we were all intensely moved by the story, and overjoyed by their rescue. “Because it is the truth of the human situation. Those boys are you and me. Others come to their rescue and finally they are set free,” he said. “In that story we recognise a kind of good news that goes to the heart of the truth of where we are as human beings. “We, the human race, are trapped. We mightn’t even recognize it, but this is the truth at least as the scripture has it. “And we can do absolutely nothing down there in the darkness but wait and hope that someone comes. “God comes to our rescue through Jesus who dies so that we might live. Archbishop Coleridge said the key to the journey began with listening to the Word of God. To proclaim was also to speak and to act, he said. He said “the young” were the megaphone, and were posing many difficult questions about parish life. “Are they (young people) saying we need a new paradigm?” Archbishop Coleridge said. “Do we need a new paradigm of our local communities of faith? “How can we imagine the parish as something new, something that doesn’t leave everything behind, but isn’t afraid to do it differently? New Zealand Cardinal John Dew at the Proclaim Conference in Brisbane. Photo: Mark Bowling. Keynote speaker, New Zealand Cardinal John Dew from the Archdiocese of Wellington, spoke about “leadership in a time of change”. He said New Zealand Catholics looking for answers to “renewal” took heart from Pope Francis. “The Pope is encouraging us to go out of our buildings and find those on the peripheries. The poor, the imprisoned and the sick are unlikely to come to us,” Cardinal Dew said, quoting from replies that New Zealand parishioners had written during a recent survey. 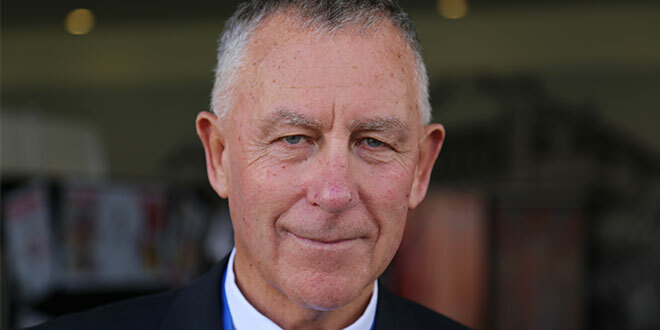 On the conference sidelines Cardinal Dew spoke about how renewal or “amalgamation” was being tackled in New Zealand parishes. “And most of them are working well together, but it’s still taking time to learn how to share responsibility. We’re really pleased with it,” Cardinal Dew said.